Alan Guy MBE was sent to Korea two months after his 19th birthday. 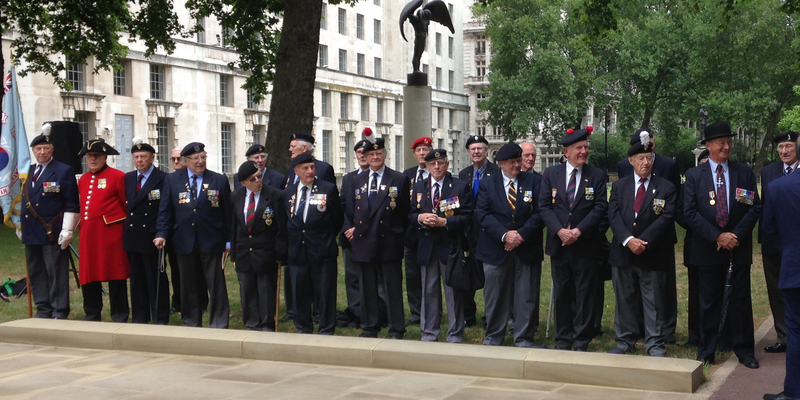 Today, he was one of 50 fifty British veterans who gathered at the Korean War Memorial in Whitehall, London to mark the day on which the armistice was signed 62 years ago. Mr Guy was stationed north of Uijongbu for 18 months as a Sergeant in the Royal Army Medical Corps, where he advised front line units on how to prevent diseases commonly caught by soldiers in the trenches, including frostbite and malaria. He welcomed the opportunity to remember the courage and sacrifice of British veterans who fought in the Korean War in a memorial service today. It is important to remember the Armistice in the Korean War because it was on that day that hostilities ended and the Korean people were once more able to live in a peaceful environment. It was from this particular day that ROK was able to raise itself from the ashes of war and build itself into one of the most vibrant and successful countries in the World. When the Korean Embassy asked if we would like a Memorial in London, I was overjoyed but unsure whether it would be possible in my lifetime. I had dreamt of having a monument to ensure that our close comrades who fought and died in Korea would be remembered forever. I am thrilled that my dream was realised and that I can remember them here today. The British Veterans of the Korean War 1950-1953 War will be forever grateful to the people of Korea for that gift to our Capital City and our thanks go to all who made it possible. A trumpeter from the Band of the Scots Guards sounded the Last Post before a One Minute’s Silence was held to remember the sacrifice of those made to defence freedom and democracy in the Republic of Korea (ROK), and a plaque was unveiled at the foot of memorial. Today is about commemorating an important campaign, which saw more than 1,000 British men lose their lives as part of the United Nations forces in the fight to provide freedom for Korea. I am proud to honour their memory and mark their courage and commitment with veterans in what was a very bloody conflict. Around 82,000 British personnel from the Royal Navy, Army and Royal Air Force served on the Korean peninsula as part of a United Nations Force after the North Koreans invaded the South in June 1950. They fought for peace alongside servicemen from the United States of America, Canada, Australia, India and many other UN member states. As well as those who lost their lives, some 1,060 had been taken prisoner by the North Koreans by the time an armistice was signed on 27 July 1953. 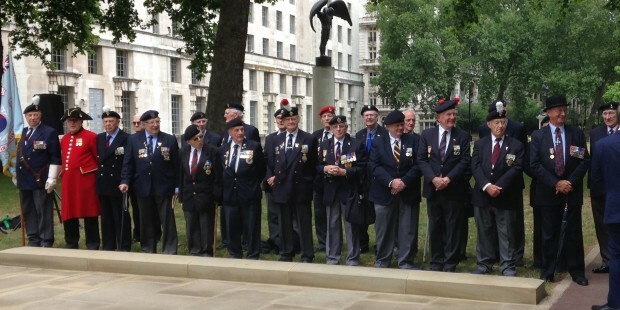 Veterans gather at the Korean War Memorial in London on 27 July to mark the day on which the armistice was signed 62 years ago. The memorial, a gift from ROK to honour the British troops that served between 1950 and 1953, is in the form of a bronze statue of a British soldier by sculptor Philip Jackson. The British Korean Veterans Association, the Embassy of the Republic of Korea in London and the Korean Ministry of Patriots’ and Veterans’ Affairs have all been involved, as have The Lady R Foundation and the British Government. Follow us on Twitter and don’t forget to sign up for email alerts.